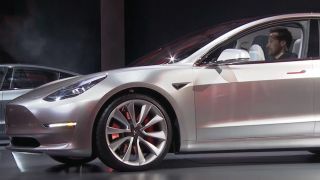 Tesla has announced plans via the SEC to sell approximately $1.4 billion (about £959 million, AU$1.9 billion) in shares to speed up production of its upcoming Tesla Model 3 sedan. Tesla hopes the money will help speed up deliveries of the Model 3 by two years. Tesla CEO and founder Elon Musk will sell over 5 million stock options to cover tax obligations associated with the sale, bringing the total stock value to $2 billion, according to the SEC. This means Musk will boost his overall shares in Tesla, thanks to what the company itself is selling off. The Model 3 is Tesla's cheapest vehicle, coming in at around $35,000 (£30,000, about AU$48,000) before government subsidies. Owners can expect to get about 215 miles of range from a single charge, which is lower than Tesla's Model S sedan but much higher than competitors, like the Nissan Leaf's 84-mile range. Pre-orders of the Model 3 were strong, with over 400,000 people putting down $1,000 deposits as of late April. Tesla plans to produce 500,000 Model 3 cars by 2018, moving the release date up two years from its original 2020 estimate. What about that Google Car we're all hearing about?